The clients who commissioned this power yacht design are a retired couple in the Chesapeake Bay area of the U.S.A. They live aboard their boat and cruise the Bay and the Intracoastal Waterway on the East Coast. 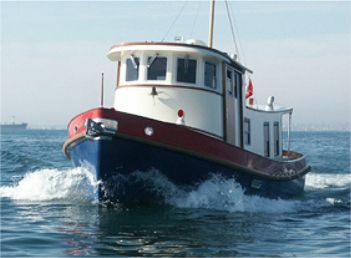 The style of the hull is traditional eliptical stern tug above the waterline combined with a trawler-yacht underbody of much lighter displacement than would be found on a working tug. 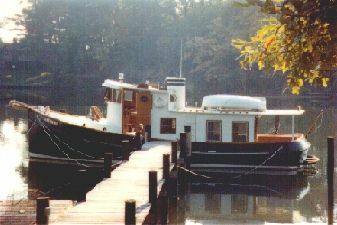 The superstructure is a blend of a traditional tug pilothouse with a deckhouse needed for the accommodation. 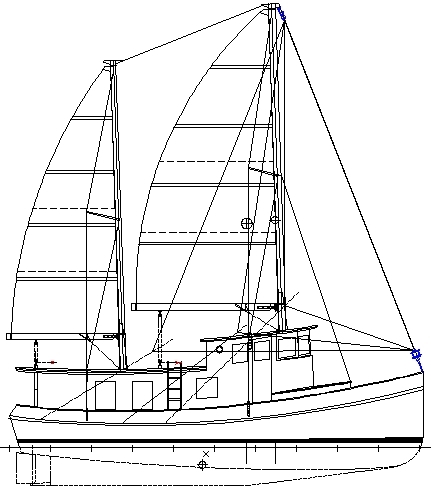 Hull and deck construction is steel using a radiused single chine hull form while the superstructure is aluminum. The junction between the two metals is either bolted, with isolation material, or welded, with a bi-metallic bonding strip. Both the hull and superstructure are longitudinally framed, i.e. the shell plating is supported by longitudinal stringers which are in turn supported by widely spaced frames. This permits simpler construction than transverse framing and presents less fairing problems. As from July 2008, we now also have drawings to build this design from wood throughout. The hull is bead and cove strip plank western red cedar, with plywood decks and superstructure. The accommodation is comfortable for a couple to live aboard with occassional sleep-aboard guests. The owners' stateroom is forward of the pilothouse from which it can be closed off by doors. It comprises V-berths, a seat, a head with basin and shower, many lockers and access to the forepeak. The pilothouse, over the engine space, houses all the controls in a central console. Alongside the console are lift-top chart lockers and a navigation area with drawers below. Behind the helm position is a short [1,85m] berth for the watch during night passages and the saloon stairs. Access to the deck is through sliding doors port and starboard. Immediately aft of the pilothouse and at a lower level is the galley to port with large work surfaces, twin sinks, ice box/ freezer, refuse bin, drawers, lockers and cooker. To starboard are lockers and a small head compartment. The saloon is open to the galley and comprises a central table with bottle stowage and hinged leaves and settees port and starboard. The settee backrests hinge upward to form upper and lower berths or to give access to the lockers behind. The fresh water tanks are built in under the settees. Through the aft door is the cockpit which is covered by an extension of the deckhouse roof. A transom door folds downward to give access to the boarding platform. On the deckhouse roof is a sunning area and the dinghy storage. The machinery space is under the pilothouse and also houses the batteries and fuel tanks. Large hatches in the floor and roof of the pilothouse will permit removal of the engine if needed. Engine and tankage shown below are as used on the first boat but are variable to suit the cruising needs of any subsequent builders. Turkey by F & A Yachting. Boats now available.